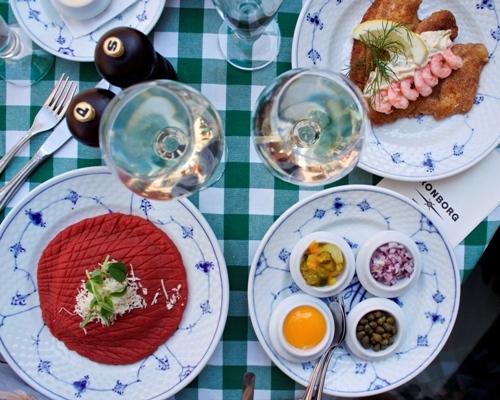 “Restaurant Kronborg is situated in centre of Copenhagen and it makes me especially happy that you can find good eateries at a reasonable price,” writes Camille Maja in the guide to her ten favourite ‘smørrebrød’ restaurants in Copenhagen. “Restaurant Kronborg is a lovely old basement restaurant which truly gives you an insight into what ‘smørrebrød” is. Kronborg serves the old school version yet with at modern twist and I adored it,” writes popular lifestyle and food blogger Camille Maja under the headline TOP 10 SMØRREBRØD IN CPH. Camilla Maja has written an entertaining and in-depth guide to her ten favourite ‘smørrebrød’ restaurants in Copenhagen and the guide features some fine pictures of the various ‘smørrebrød’ as well. We are proud and happy to be featured in the guide with, among others, the classic Restaurant Schønnemann, Restaurant Palægade and Christianshavns Færgecafé and the more modern, like Selma and Aamanns Deli. We thank Camille Maja for her visit and happily recommend that you read the entire guide at CamilleMaja.dk (sorry, in Danish only).